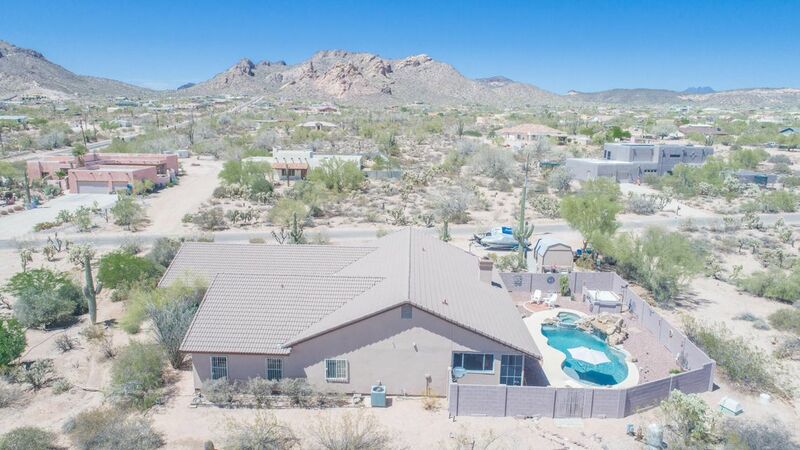 All Apache Junction homes currently listed for sale in Apache Junction as of 04/21/2019 are shown below. You can change the search criteria at any time by pressing the 'Change Search' button below. 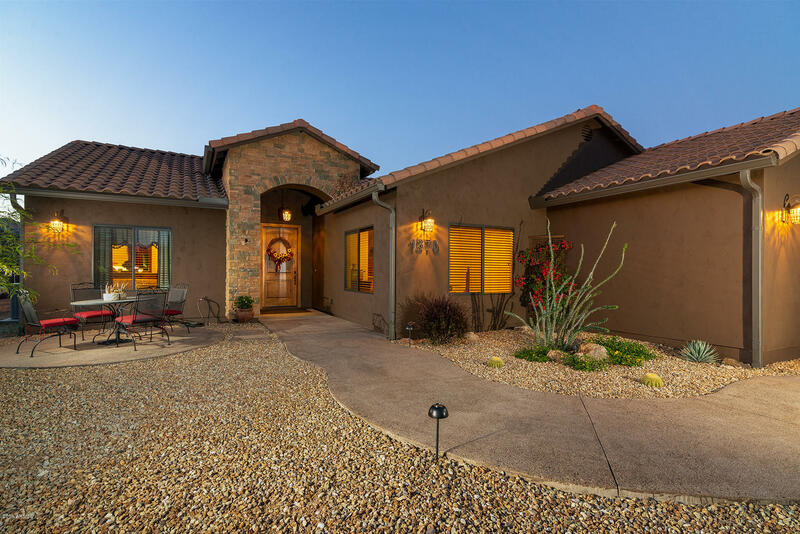 If you have any questions or you would like more information about any Apache Junction homes for sale or other Apache Junction real estate, please contact us and one of our knowledgeable Apache Junction REALTORS® would be pleased to assist you. "Huge Price Reduction! - Luxury home with Incredible Views . This has the potential to be an Assisted Living Group Home. Very peaceful and serene setting. There are many local attractions nearby. This home features a Majestic Great Room with a 14' Ceiling, 4 bedrooms & 4.5 baths in the Main house, 5 Car Garage and OVER 5900 Sq. Ft. of living space, plus 1600 sq. ft. Guest House with 2 more bedrooms and 1 bathroom. This home has plenty of room for your family and All their Toys. 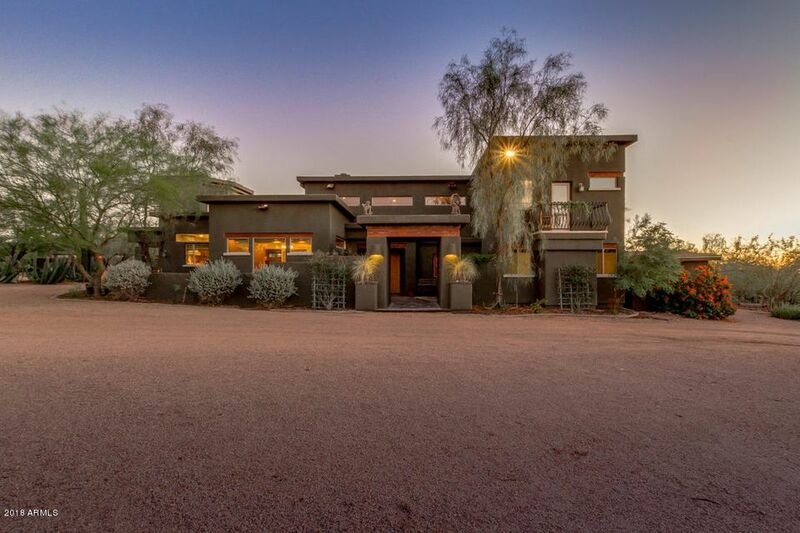 This home was con"
"Feel right at home at this Custom built home overlooking the Superstition Mountains. Entertainer's Delight, No expenses spared on this double master bedroom split floor plan. Office/Den that could also be used as a bedroom. Travertine flooring throughout, wet bar, 3 fireplaces, open floor plan, built-in speakers throughout. Kitchen features include: Granite counter tops, Sub Zero built-in refrigerator and freezer, Miele built-in coffee maker with warming a warming drawer, Gas French cook-top, Wo"
"WOW Must see Amazing Custom Basement Home on Nearly 5 Acres w/Spectacular Mountain Views & Gated Entry Feat. 4 Bedrooms + Loft/Game Room, Bonus Room/Den & 6 Full Baths, Split Great Room Floor Plan, Lots of Tile & Wood Flooring, Lots of Wood Beams, Accent Paint, Remodeled Kitchen w/Huge Island/Breakfast Bar, Granite Slab Counters w/Undermount Sink, Double Ovens & Glass Cook-Top, Pantry, Sep. Courtyard/Patio off Master Suite, Remodeled Master Bath w/New Counters, Bathtub, Cabinets, Shower & Tile, "
"This custom adobe home is thoughtfully designed with family, entertainment and privacy in mind. 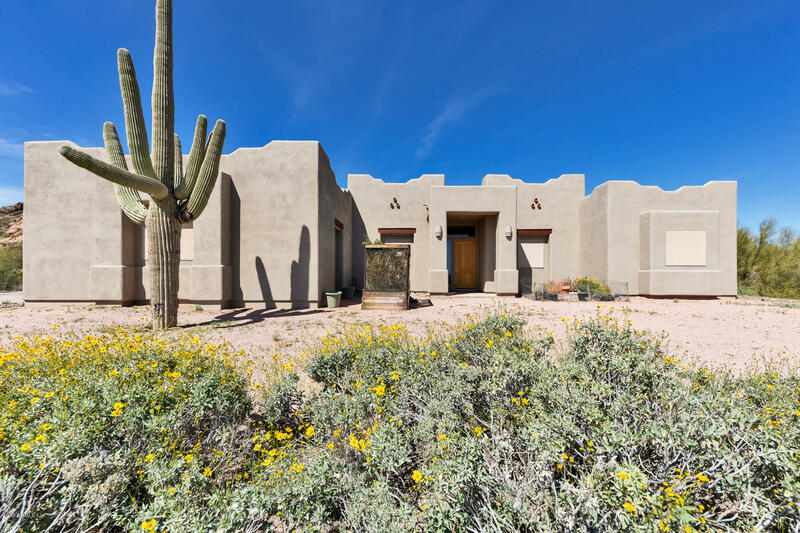 This exquisite adobe masterpiece features arched doorways, custom wood ceilings and other details that make it stand out. Wonderful combination of old world meets modern amenities. Large kitchen w/ top of the line appliances and a commercial gas range & double convection ovens. All 3 interior fireplaces are plumbed for gas. Oversized 3 car garage has ample room for large pickup trucks or SUVs.Situa"
"BEAUTIFUL HOUSE - OUTSTANDING SHOP ON AN EXTREMELY VERSATILE PROPERTY! 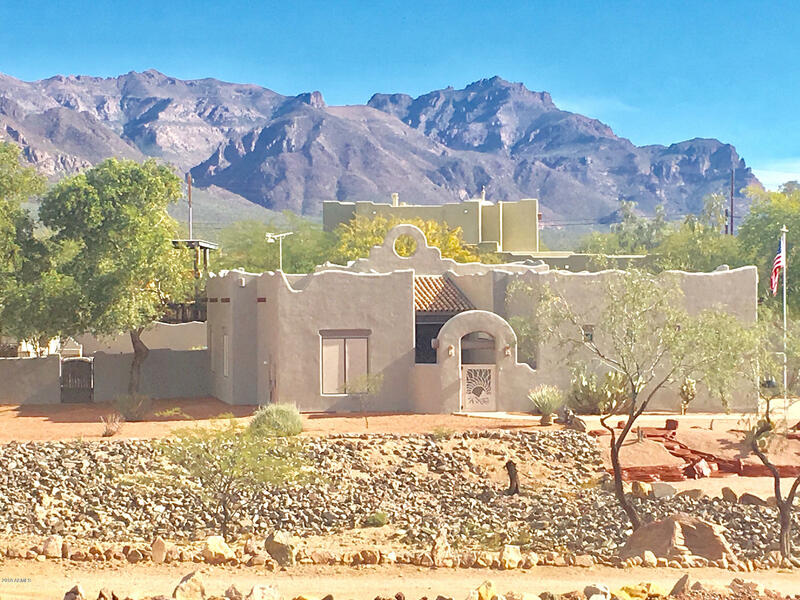 Square footage of the house includes RV GarageBeautiful 1.38 acre property with 6'' Block Walls & DOUBLE BAY RV GARAGE has stunning views of the Superstition Mountains and something special for everyone. Custom home features: Grand Entrance, Tall ceiling, Huge windows, Custom Cabinets,8' Solid Wood Doors, Wood Shutters, prewired 7.2 Surround Sound and Security Systems, Large Great Room with Fire Place, 2HVAC unit zones, Larg"
"VOTED BEST ON TOUR 2019! 2008 CUSTOM TERRITORIAL ON 1.25 ACRES. 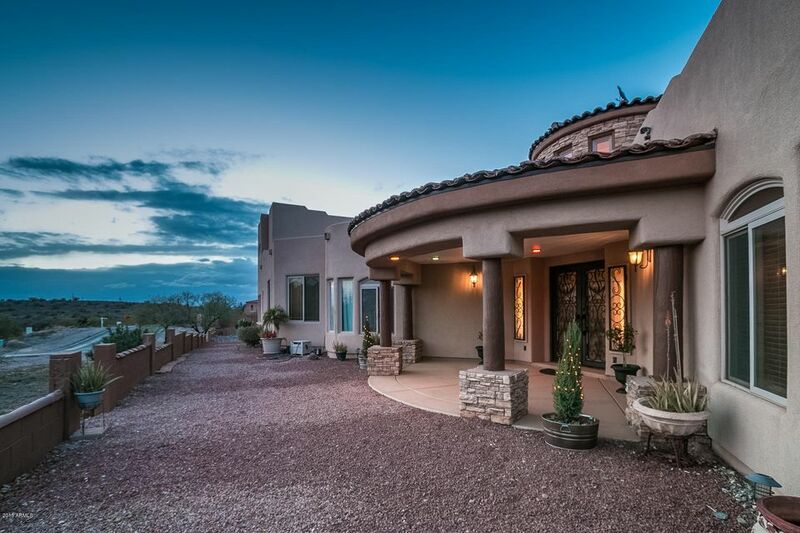 IMPRESSIVE PAVER ENTRY/DRIVEWAY LEADS TO 3,710 SF SINGLE LEVEL 3 BEDROOM + OFFICE, 3.5 BATH HOME BOASTING TRAVERTINE FLOORING, 20' CEILINGS, 8' SOLID CORE DOORS & VENETIAN PLASTER. GOURMET KITCHEN OFFERS CHISELED EDGE GRANITE, PROFESSIONAL VIKING APPLIANCES, CUSTOM WOOD CABINETRY & HUGE ISLAND THAT IS OPEN TO BREAKFAST ROOM & LIVING ROOM. MASTER RETREAT FEATURES MAGNIFICENT STONE FIREPLACE, SNAIL SHOWER W/DUAL SHOWER HEADS, JACUZZI "
"CUSTOM HOME FACING THE SUPERSTITION MTNS,3477 SF HOME, 49541 SF LOT, SINGLE LEVEL, FOUR BDRMS AND 3 1/2 BATHS,EXTERIOR HAS FRESH PAINT, OFFICE WITH PRIVATE DOOR TO EXTERIOR, DRAMATIC COVERED PORCH, PAVERED DRIVEWAY WITH ROCK WALLS ON BOTH SIDES, PAVERERED PATIOS, KITCHEN HAS ALDER CABINETS, KITCHEN ISLAND, GRANITE COUNTERS, WALKIN PANTRY, DINING ROOM ATTACHED, 12 -14 FT CEILINGS ,4 '' DARKWOOD SHUTTERS THRU HOME, LG FAMILY ROOM HAS FIREPLACE, MASTER SUITE HAS PRIVATE PATIO, SEP. SHOWER/T"
"REDUCED! Secluded yet close to everything important. PLEASE SEE - aerial photos, 2 - Matterport Floorplan-Dollhouse & Vacant View in Virtual Tours, Photo's under the Photo TAB. Perfect for a residence/retreat whether personal/ corporate. Has Horses set-up (EZ take down if not wanted). 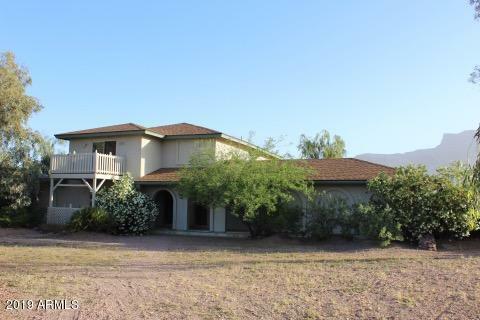 Surrounded by many 1,000's of acres with unlimited miles of hiking/biking/riding trails, splendor of the High Sonoran Desert with all flora & fauna, 360 Views of mountains & valley (day/night) with spectacular vist"
"CUSTOM built home w/insulating concrete foam construction = 6'' concrete walls plus 5'' of foam insulation for low utility bills. 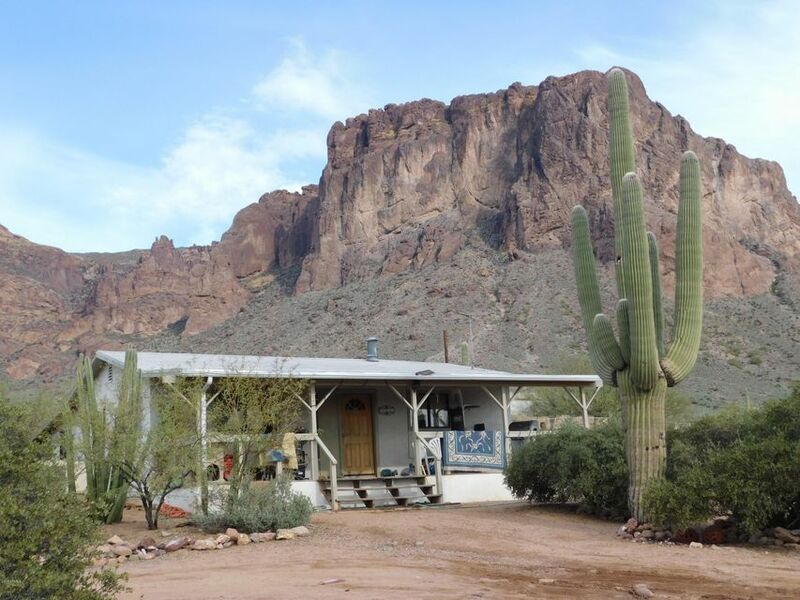 1500 sq ft HEATED/COOLED SHOP w/3 PHASE POWER, 3'' INSULATED foam walls, 3 ROLL UP doors & 750 sq ft semi-enclosed RV garage & Domestic water well w/views of the Superstition & Goldfield Mountains. Upgrades include 6'' thermal mass INSULATED stained concrete flooring, Stone Creek CUSTOM, BUILT-IN living room entertainment center & desk & book cases in Den, recessed L"
"Prepare to be amazed! 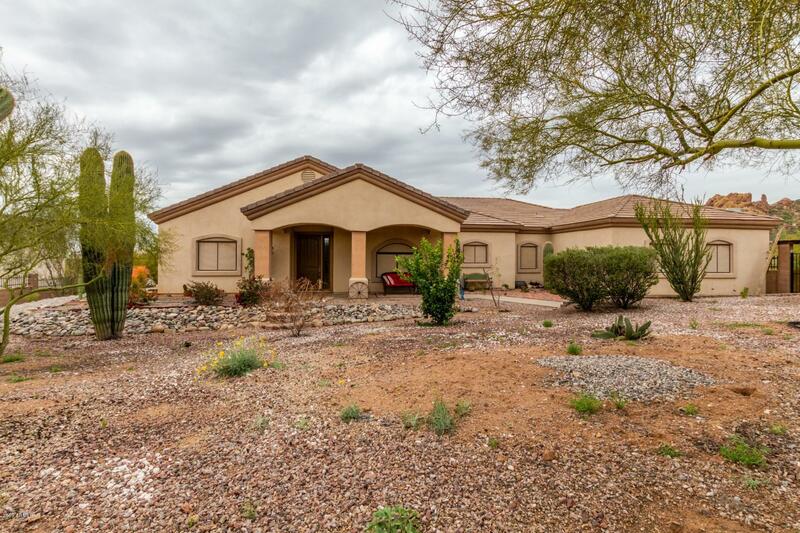 Hurry and see this luxurious 3 bed, 3 bath property now for sale in Apache Junction! 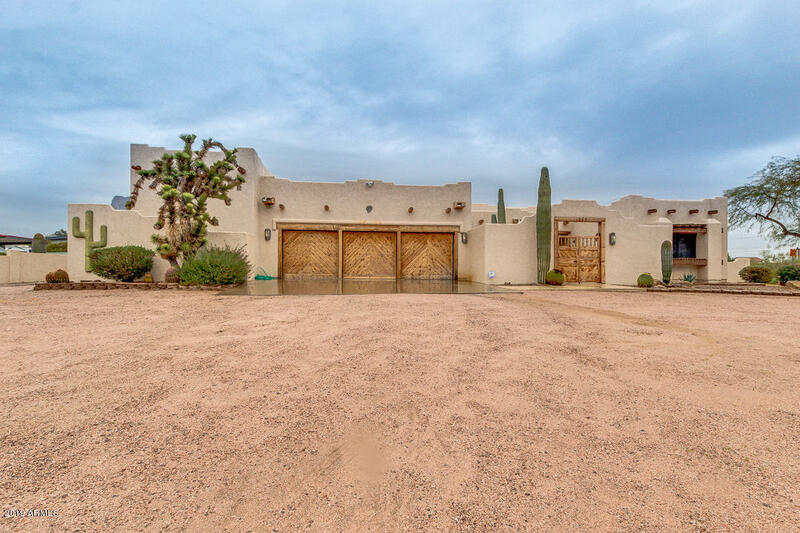 This stunning home boasts desert landscaping, circular drive, 3 car detached garage, formal dining and living areas each with a fireplace, a cozy den, library/study, game room, a lovely deck with mountain views, wet bar and designer paint throughout. The fabulous kitchen offers ample cabinetry, a walk-in pantry, granite countertops, stainless steel appliances including a wall oven, and an i"
"Stunning Custom Beauty High Up On The Mountain Features Elevated Views In ALL Directions! Beautiful Tiled Floors & Counters, Knotty Alder Cabinets & Doors, Seamless Windows, 2 Fireplaces, Upgraded Fans & Fixtures T/O, Hand Peeled Log Beams, Latias, Vegas, Incredible Enormous Office Addition PLUS Outdoor Kitchen & Living Area w/River Waterfall & Pond To Perfectly Accent The Miraculous Sunsets! Call Lister For Appointment To Show - Must Be Experienced In Person To Truly Appreciate!" "Drastic Reduction!! Own your own piece of paradise. 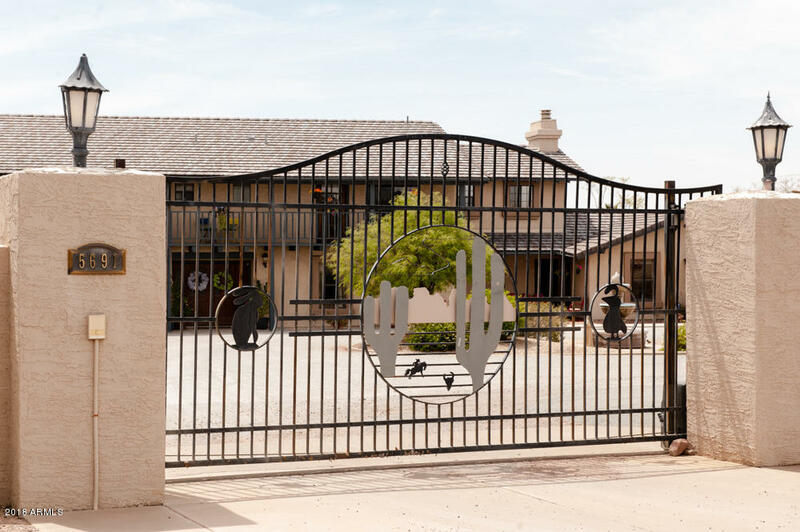 2 acres completely fenced with an electric private gate. Home is over 6000 sq ft under roof. (garage is over 1000 sq ft!) has 6 bedrooms, and 4.5 baths. Master is huge, you may never want to leave! Enjoy coffee in your small attached kitchen. Then go and sit on the balcony overlooking the Superstitions & city views. Second master with attached bath. Family room is huge with fireplace and custom bar. Kitchen is fit for the pickiest chef, and for"
"Known as Superstition Shadow Ranch, this gorgeous property epitomizes the freedom of living the Wild West dream. The property is already set up for horses. Enjoy beautiful mountain views from your swimming pool or from any of the outdoor spaces. 2 covered patios and balconies. The kitchen is worthy of an iron chef with large island and granite countertops. 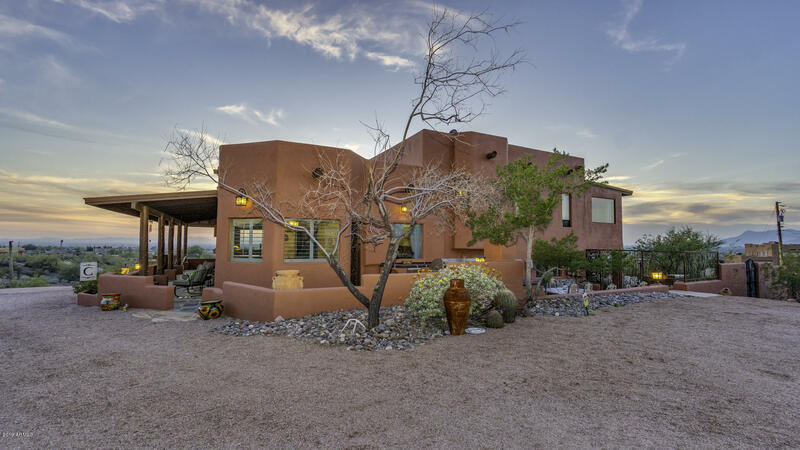 Everything in here has been remodeled!The property also has a casita which is equipped with a kitchen, bathroom and shower. It's currently be"
"Wow! 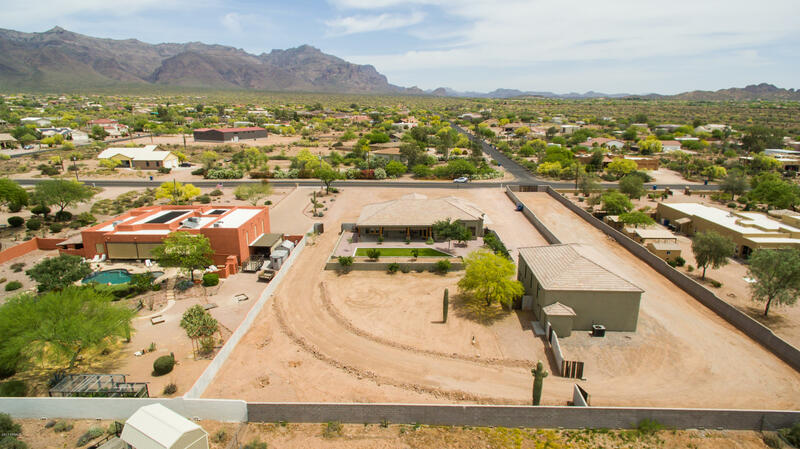 Amazing property in Apache Junction can now be yours! 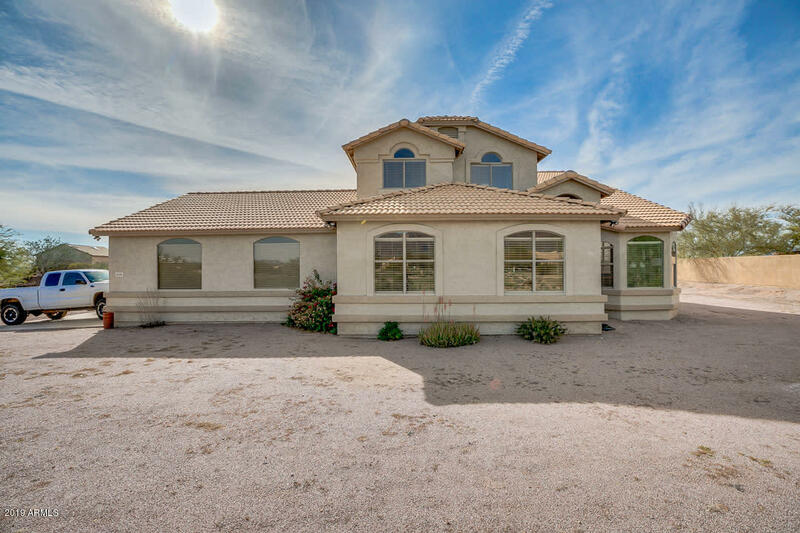 This fantastic 3 beds, 2.5 baths home sits on an oversize corner lot & features desert front yard, 3 car garage, RV gate, and courtyard. Beautiful interior boasts beamed callings, living room with fireplace, formal dining, tile flooring, fireplace in family room, and plantation shutters. Delightful kitchen includes matching appliances, ample cabinetry, solid surface countertops, and center island. Master suite has private exit, bath with"
"Captivating 5 bedroom, 2.5 bath 2,992 sq. 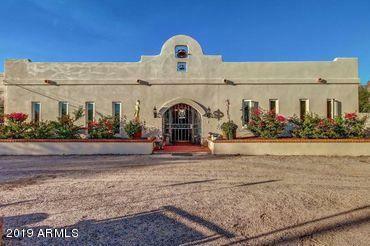 ft. home with stunning mountain views, situated in Apache Junction on over an acre of land. Pristine, low-maintenance desert landscaping in front. Covered patio, hot tub, built-in BBQ and large barn, ideal for storage, in back. Convenient 3 car garage. Immaculate tile and plush carpet interior flooring. Sky-high vaulted ceilings. 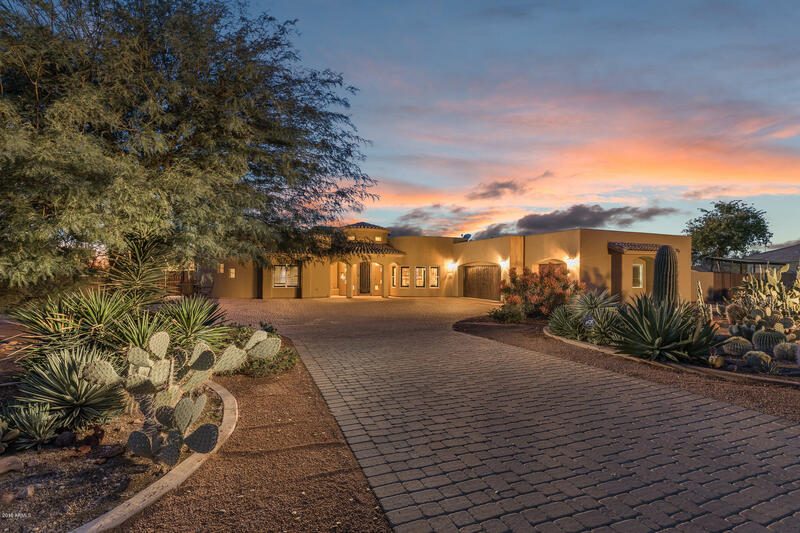 Ultramodern kitchen boasting granite countertops, breakfast bar, custom, light wood cabinetry, custom overhead lighting, and t"
"Beautiful custom home sits on 2.5 acres lot just below the Goldfield Mountains and a stone's throw away from Tonto National Forest. 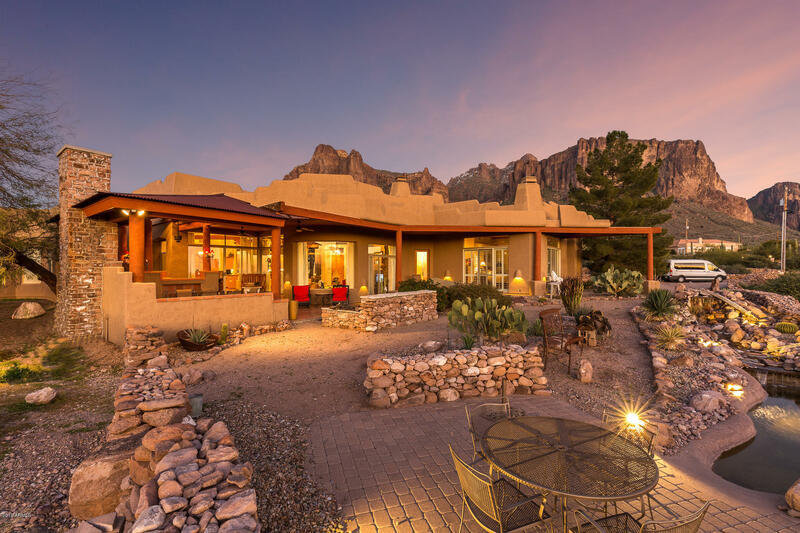 Elevated Views In ALL Directions include the Superstitions & Goldfield Mountains and city lights. Enjoy the refreshing pebble-tec playpool or the in-ground heated spa as you take in the views. This home boasts an open, inviting floor plan and 4 large bedrooms and 3 bathrooms. Smart design allows direct access to one of the bathrooms from the pool/patio. Beautiful Tr"
"TONTO NATIONAL FOREST BOUNDARY...2.5 ACRES!!! You are at the driveway...what a view of majestic Superstition Mountain! Tonto National Forest is your backyard! Now turn around and look at that ''Valley'' view...isn't that incredible! Drive up at night for a light show! 2.5 acres of land with almost 360degree views! The home has 3 spacious bedrooms, 1.75 baths a big kitchen and dining area and two covered patios to enjoy the fantastic views. The home is nice and very livable but the value, "
"MASSIVE LOT! THIS GORGEOUS SANTA BARBARA CUSTOM HOME IS LOADED WITH EXTRAS AND ON HORSE PROPERTY! 3 HUGE BEDROOMS WITH A DEN AND 2.5 BATHS! THE MASTER INC. A GARDEN JETTED TUB W/SEPARATE SHOWER, DRESSING VANITY & HUGE W/I CLOSET! HUGE U SHAPED KIT W/COOK ISLAND,B/I DESK,PANTRY, REFRIG. AND COMMERCIAL FREEZER! LG UTILITY RM W/SINK,W&D,CABS. LG SEWING/HOBBY RM! HUGE GR W/TRAVERTINE FIREPLACE! HUGE FOYER W/HARDWOOD! SOARING WOOD CEILING IN GR AND FOYER! 4 SETS OF DBL DOORS. ALL DOORSW/SECURITY! 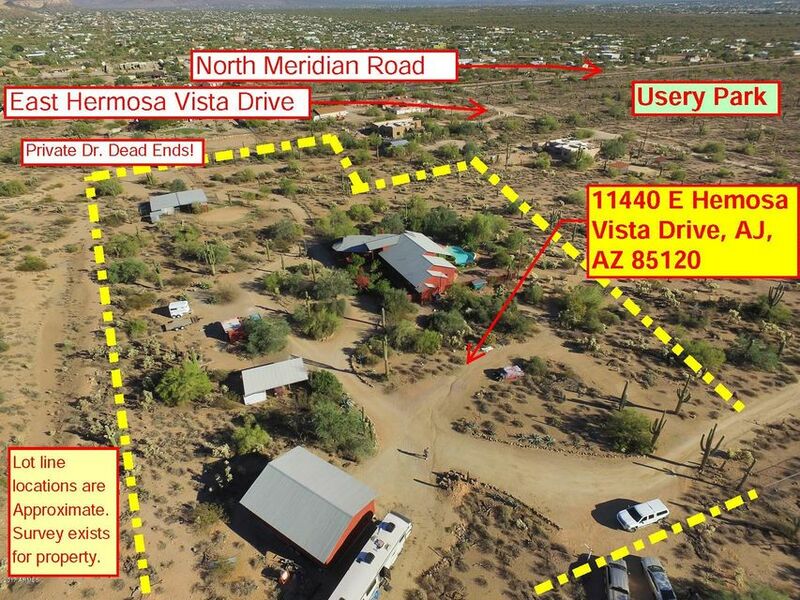 S"
"This 1.01 Acre Property is One Parcel from the Tonto National Forest Bulldog Canyon Gate to access over 160,000 Acres of Horse back riding, Off Roading, Hiking or Biking! 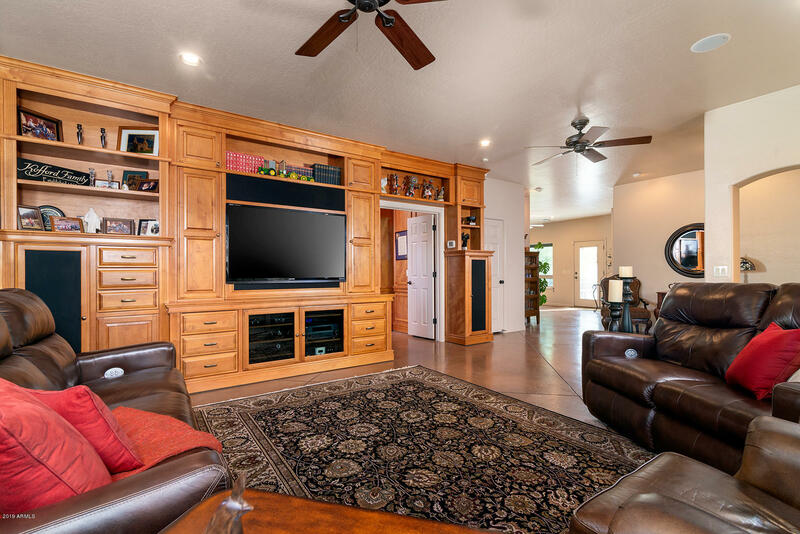 This 2014 Goldfield Mountain Custom Upgraded home has lots to brag about from the Location, Views, Wildlife, Upgrades, Landscaping, Horse Corral with Pasture, Hay Barn, Tack Room with Porch, RV/Trailer parking, Remote Control lighting. Storage Shed, PRIVATE WELL, Split Plan and TOO much more to tell you about here! 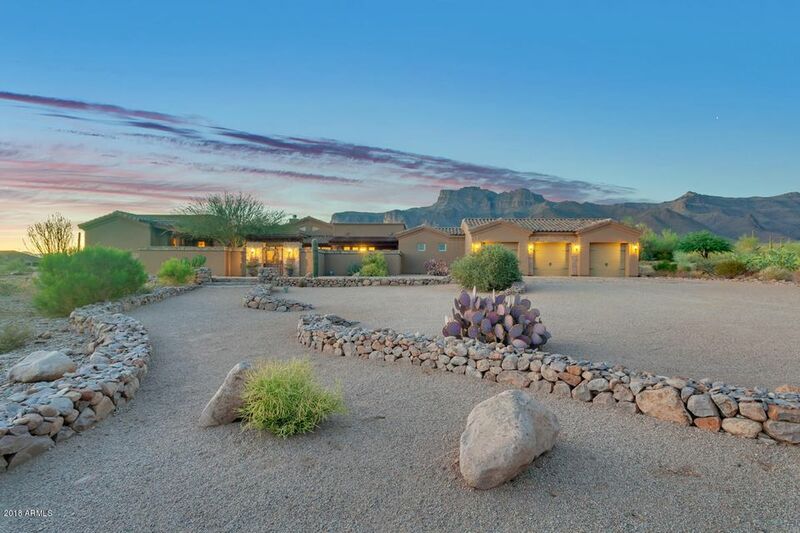 Just some of"
"In search of a home that has 360 degrees of gorgeous views in the Superstition Mountain area? This home is unique and full of character. Many skylights and numerous windows bring in the natural light and views that you just can't get enough of. The kitchen is bright and cheery and opens to a fantastic dining area. The split-level floor plan allows for much versatility whether you have a multi-generational family or want to use the lower level for a game room and guest room area." "Amazing Views - Mountain and City Lights Huge 1.25 acre Elevated Lot with newer 2016 built home and a PRIVATE WELL!!! Spacious 4 Bedrooms, 2 Baths, Over-sized 4-Car Garage w/Slab Parking for 8+ Cars, Open Kitchen, Granite Counters, Walk In Pantry, Staggered Cabinets and Upgraded Stainless Steel Appliances. The Master Bath has a Separate Tub/Shower, Dual Sinks w/Granite Vanity Top and a Walk In Closet. 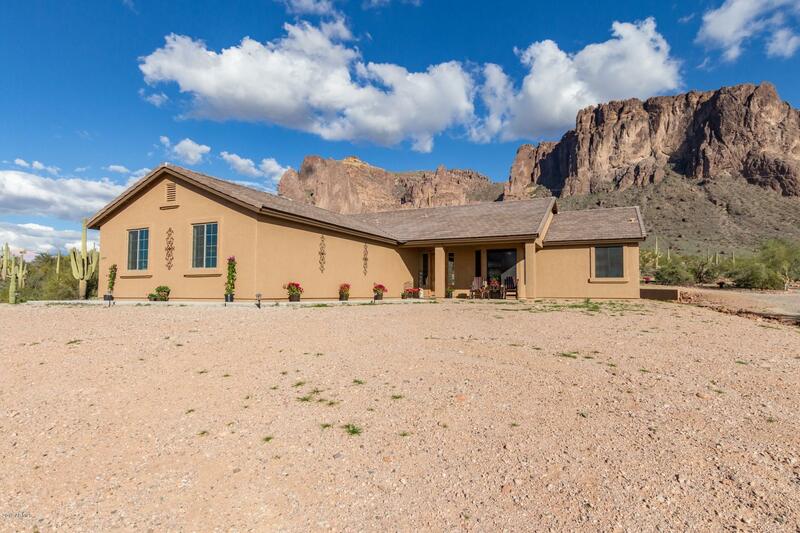 There are Upgraded Interior Doors, Oil Rubbed Hardware, Tu-Tone Paint, Ceramic Tile Flooring in"
"Beautiful completely renovated 5 bedroom home with stunning views of Superstition Mountains. Custom hickory cabinets and granite countertops in kitchen and all bathrooms. New tile throughout, new furnace, air conditioners, light fixtures, ceiling fans. Neutral paint throughout. 1100 sq ft finished lower level with full bath, possible In Law suite. First floor laundry room, 3 car garage with new epoxy floor. Beautiful pool with slide and spa. Home warranty included. Move in ready, gorgeous!" 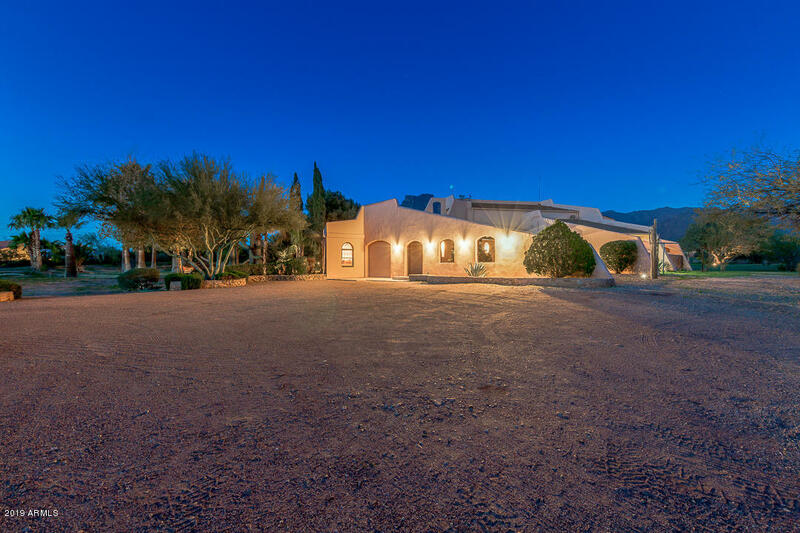 "CUSTOM SPANISH TERRITORIAL ON 1 1/4 ACRES OF HORSE PROPERTY - INVITING COURTYARD ENTRANCE - OPEN FLOOR PLAN - BACKYARD ENTERTAINMENT BEGINS WITH SUMMER FUN IN THE PEBBLE TEC POOL W/SLIDE, GROTTO & LIGHTED WATER FEATURE TO THE COZY WINTER NIGHTS BY THE KIVA OUTDOOR FIREPLACE AND FIREPIT. BEAUTIFULLY TILED THROUGHOUT - CUSTOM TILE COUNTERTOPS - NEW APPLICANCES - FAMILY ROOM FEATURES 10FT STEP CEILINGS, ELECTRIC FIREPLACE AND ENTERTAINMENT NICHES - PRIVATE ENTRY MASTER SUITE IS DISTINCTIVE WITH SPA"
"Large 4 bedroom home on 1 acre level lot, completely fenced, lush landscape, 3 RV gates. This home has been well maintained and has a new lower roof and 2 year old upper roof. Very energy efficient with double and triple pane windows and updated high efficiency split A/C system. 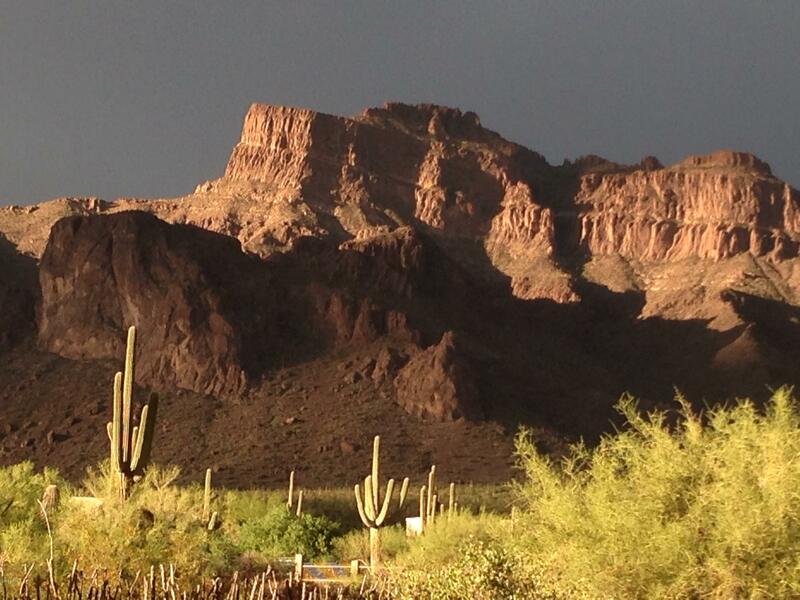 Beautiful mountain views of the Superstition Mountain and Goldfields."